WHITAKER BANK BALLPARK (Lexington, KY) - The Lexington Legends fell in game three to the Asheville Tourists 6-3, but take the important series overall over the Tourists. 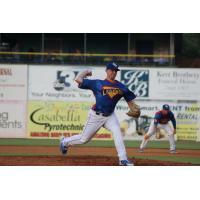 The Legends are now tied with the Greenville Drive for first place in the Southern Division. The Tourists plated five runs in the top of the third inning. Matt Hearn drew a walk then stole second base. Sean Bouchard then lined an RBI single up the middle to bring in Hearn and Asheville led 1-0. Bouchard then moved to second when Casey Golden drew a walk. With two runners on, Ramon Marcelino blasted a three-run homer to left centerfield and the Tourists extended their lead, 4-0. The very next batter, Todd Czinege, smacked a solo home run and Asheville led 5-0. In the bottom of the third, Kyle Isbel hit a groundball to right field. Cristian Perez then golfed a two-run home run to left field and the Legends were on the board, 5-2. In the top of the fourth, Austin Bernard hit a leadoff single to right field, then moved to third on a single by Matt Hearn. Ryan Vilade then popped up a sacrifice fly to centerfield, bringing in Bernard and Asheville led 6-2. The Legends plated their final run of the game in the bottom of the fourth inning. Jeison Guzman hit a single to left field then advanced to second on a throwing error by the Tourists. Marten Gasparini then brought Guzman home with an RBI single, but Lexington still trailed 6-3. Lucas Gilbreath was awarded the victory for the Tourists tossing 6.0 innings allowing three runs (two earned) on five hits while striking out seven. Charlie Neuweiler was given the loss pitching 3.0 innings allowing five runs on four hits while walking two and striking out four. The Legends now welcome in the Kannapolis Intimidators for a three-game series beginning tomorrow, August 10 at 7:05 p.m. at Whitaker Bank Ballpark. The Legends will honor the former AHL and Lexington's first minor league professional ice hockey team the 'Kentucky Thoroughblades' for one night only, when they wear special edition jerseys! The Kentucky Thoroughblades were an AHL Affiliate of the San Jose Sharks that played at Rupp Arena from 1996-2001. The Legends players will wear special hockey sweater-inspired jerseys depicting the famous Thoroughblades logo and colors as a Legends baseball jersey. The hockey sweater-inspired jerseys will be auctioned off online during the game at www.lexlegends.gesture.com. All fans present and not present will have the opportunity to bid on the jerseys via their phone or other devices beginning at 6:00pm. Fans can expect Legends Thoroughblades apparel available for purchase! Former Thoroughblades mascots and players will be in attendance as well. Stick around after the game for another Friday Night Fireworks Show!